* NEW RESIDENTIAL CUSTOMERS ONLY. $35 ACTIVATION, EARLY TERMINATION FEE ($15/MO) FOR EACH MONTH REMAINING ON AGMT, EQUIPMENT NON-RETURN & ADD’L FEES APPLY. Price is after $5/mo. autopay discount for 12 mos. Pay $40/mo. + taxes until discount starts. Discount is instant for online orders on att.com only. In other channels AutoPay is req’d and discount starts w/in 3 bills. I. Restr’s apply. If you are looking for entertainment for your family, you will want a wide range of channels and plenty of programming to match everyone’s tastes, without spending too much. Get U-family from U-Verse TV and find the programming that fits your need, from a company you can rely on. U-family exceeds your basic TV package. Bundled with more than 200 family-friendly channels, U-family has programs which cater everyone’s demands. U-verse TV packages can be personalized to fit your entertainment preferences. Include high-definition programming and premium channels to your package to make your home entertainment dreams become a reality. The children’s playroom has enough clutter without adding extra cords and wiring, which is why the Wireless Receiver offers you U-verse TV without additional equipment. Just install it wherever you want in your house where a power outlet is located—even if it’s outside. Now you and your family can watch the latest MLB highlights or NBA playoffs. Dad can even check in on Sunday golf during NFL commercial breaks. Whatever the sport, U-verse TV has a channel to cover it. Provide your loved ones with an opportunity to explore new cultures and distant nations from the convenience of your couch. U-verse TV International packages offer you, and your family, a preview of what the world is watching. With U-Verse TV, you can experience On Demand family programs on your computer or smartphone wherever you have a Wi-Fi connection. Control your queue and schedule recordings with the U-verse TV application so you never have to miss out on a family favorite. Watching television is not only about the programming anymore. It’s mainly focused on the quality of the program and how you watch it. Where do you start? U-verse TV makes it simple by providing On Demand programming, HD channels and the Total Home DVR®. Change your entertainment experience with U-family. Often times you feel like watching something exclusive. Thanks to U-verse TV On Demand, you have access to thousands of shows and movies. Rent the latest Hollywood blockbuster or rediscover an old time favorite, all from the convenience of your couch. U-verse TV gives you numerous HD channels to enjoy! Add HD to your U-family package in order to access the TV shows and movies you wish to watch. If you want the best in home entertainment, you should get HD. Maximize you’re viewing time with a Total Home DVR®. 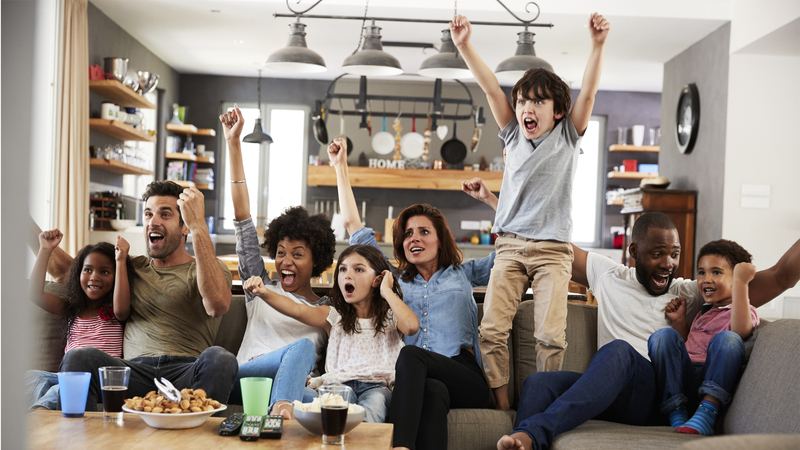 Included in the U-family package, the Total Home DVR® lets you record 4 shows at once and play them back in any room, pause and rewind live TV, and even pause your recorded show in one room and pick it up in another. Watch the latest movies and most-popular shows on premium networks. HBO®, CINEMAX®, SHOWTIME®, STARZ®, ENCORE®, and EPIX®! Total Home DVR function is available on up to 8 TVs, and requires a receiver for each TV at $9/mo. With triple play and double play plans it’s now easier to bundle your Internet and Phone services with your U-verse® TV packages. This will not only save you money but also provide the benefit of consolidating your payments into a convenient single bill. Catching the latest movie or binge watching an entire season of your favorite TV show with your loved one is always fun. With U-verse® TV you can always enjoy high quality content by simply selecting the U-verse® TV package that suits your preference, then you’re ready to indulge in your favorite entertainment. 1 - YR U-family ALL INCLUDED TV PACKAGE: Ends 5/31/18. $35 for first 12 mos. only. After 12 mos, then prevailing rate applies (currently $81/mo), unless cancelled or changed prior to end of promo period. Pricing subj to change. $5/mo. discount: Must enroll in autopay w/in 30 days of TV activation to receive bill credit starting in 1-3 bill cycles. First time credit will include all credits earned since meeting offer requirements. Autopay requirement waived for online orders on att.com only. Incl. U-Family All Included HD service, equip fees for 1 HD DVR and standard pro installation. Exclusions: Price excludes applicable use tax expense surcharge on retail value of installation, custom installation, equip upgrades/add-ons (each add ’l receiver $10/mo) & other charges, including Broadcast Fee (up to $5.99/mo), a federal regulatory video cost recovery chrg and city video cost recovery fees. Credit restr’s apply. Different offers may apply for eligible multi-dwelling unit customers.